You will sizzle in this hot number that includes a dress with a tail and a headband of horns. COSTUME INCLUDES TOP WITH ATTACHED WINGS, SKIRT WITH ATTACHED LEGGINGS, DETACHABLE BELT WITH CROWN BUCKLE AND HORN HEADPIECE. AVAILABLE CHILD SIZE 7-8 AND 10-12. PITCHFORK, PURSE AND OPTIONAL ACCESSORIES AVAILABLE. 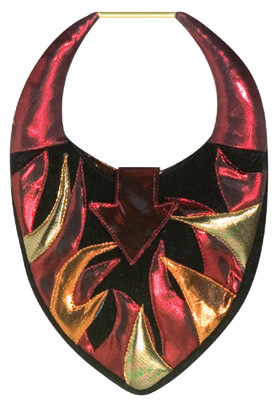 A nice bustier to add a little fire to your Devil costume. 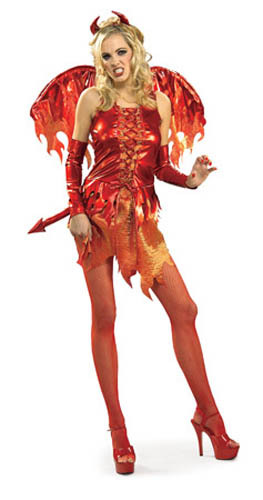 COSTUME INCLUDES DRESS, HORNS, WINGS, SLEEVELETS AND TAIL. The best of both underworlds! 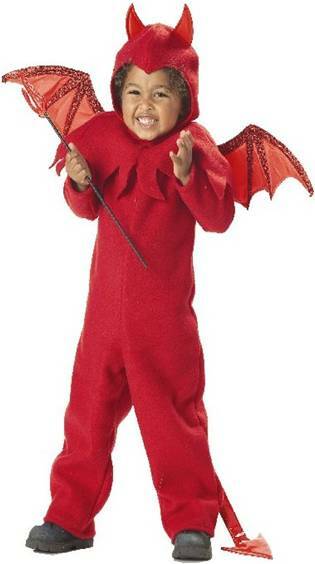 Dress up in this reversible costume that includes a devil and vampire costume. Includes corset, skirt, cape, headband, tail and purse. COSTUME INCLUDES RED SHORT DRESS WITH GOLD DETAILED SHEER SLEEVES & MATCHING HEADPIECE. RED FISHNET STOCKINGS AND PITCHFORK SOLD SEPARATELY. For full-figured frames. Includes dress and headband. FLAME PRINTED KNIT LACE UP FRONT DRESS AND MATCHING CAPE. INCLUDES HORNS AND PITCH FORK. LITTLE ANGELS BEWARE: THIS IS NO ORDINARY DEVIL! COSTUME INCLUDES HOOD WITH ATTACHED HORNS AND HALTER RUCHED SKIRT DRESS. PITCHFORKS, STOCKINGS AND SHOES SOLD SEPARATELY. 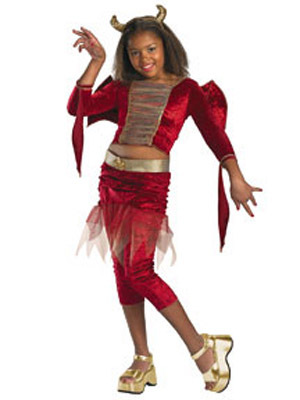 COSTUME INCLUDES DRESS WITH FLAME DESIGN AND GLOVELETTES. HEADPIECE INCLUDED. WIG, MAKEUP AND CONTACT LENSES SOLD SEPARATELY.